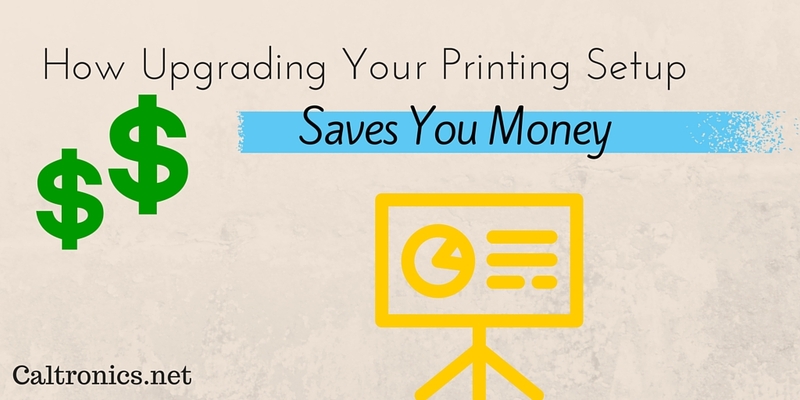 Are You Bleeding Money from Your Printing Setup? Most people realize that printing can be costly, but you may be surprised at the massive potential expense of your business printing setup. The day to day cost of printing errors and inefficient printing can stack up quickly and negatively affect your group’s bottom line. Many businesses only look at the cost of physical printing supplies – ink, paper, and equipment, but in reality you may be hemorrhaging printing costs from several different sources. Supplies alone aren’t cheap. Consumer Reports has stated that printer ink ranges in price from $10 to $75 per ounce. Yet, that’s just the tip of the iceberg. Printing errors cost time – time wasted waiting for repairs, time wasted on re-prints, and time wasted on backlogs. All this lost time costs you in productivity. For example, let’s consider a simple printer head cleaning. This error is usually discovered when a page comes out of a printer blurred and illegible. An employee tries to fix the error, wasting more ink and paper in the process. In the meantime, other print jobs back up. Employees can’t move forward with their work and the problem still may not be fixed, not to mention the wear and tear this places on your printing equipment, depreciating its value. The environmental impact should also be considered as needless waste could prevent your business from accomplishing any green initiatives. Really, there’s a myriad amount of problems that can harm your printing setup. Shortage of supplies, out of date drivers, untrained employees, and improper network setup can all contribute to an inefficient system. It’s no wonder that International Data Corporation (IDC) has reported that business organizations can spend up to 3% of their annual revenue on printing costs. At Caltronics Business Systems, we understand the difficulties of setting up and maintaining an efficient, smoothly-running print system, and we provide the solutions. Our Managed Print Services (MPS) program is custom tailored to fit your business needs and keep your workflow flowing. Companies from small to massive in size have discovered that an MPS manages their printers, copiers, scanners, and faxes efficiently, allowing them to get on with business. In fact, IDC has found that having an MPS program in place can cut overall printing costs anywhere from 20% to 30%. Our skilled specialists and technicians take on the complete burden of your printing environment by first analyzing your needs in-depth. After completing the on-site assessment, we’ll present a proposal for your approval. After that, we’ll handle all your document workflow needs. We’ll provide a concierge service where we set up any equipment, upgrade obsolete hardware, train your employees on its use, and handle any software needs. Of course, we provide proactive servicing and ongoing timely support if you ever run into difficulties. Furthermore, we provide any reports you may need relating to your document workflow, such as output, compliance, or job accounting. By handling all your business document needs, Caltronics frees up you and your employees to handle more critical tasks and be more productive. This entry was posted in Uncategorized on April 22, 2016 by riehlt. 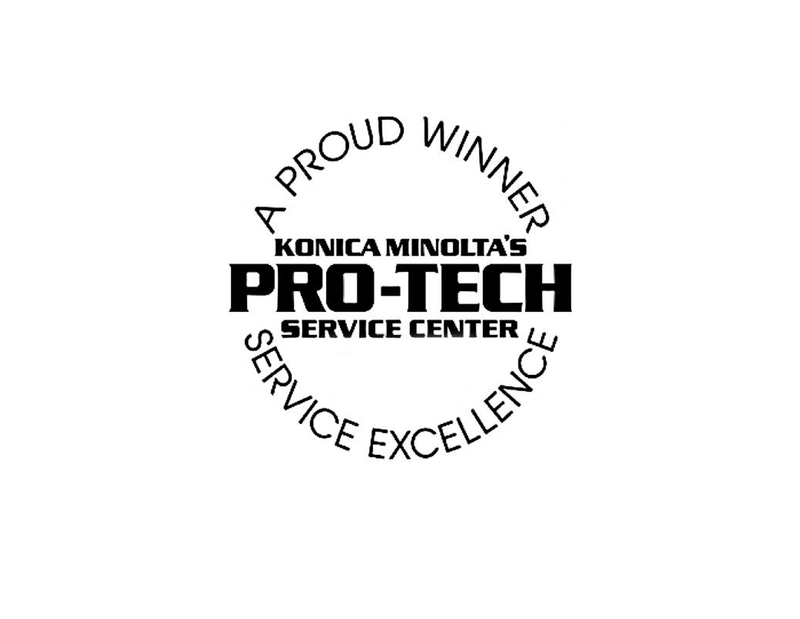 The Konica Minolta Pro-Tech Service Award is given only to the best of the best, those companies that embody the ultimate in equipment and customer service. We at Caltronics Business Systems are proud to be twelve-time winners of this measure of outstanding service management. Being a recipient of the Pro-Tech Service Award means that we have shown and continue to demonstrate a dedication to quality, technical proficiency, customer satisfaction, and management. When your products need service, your business can’t wait. We at Caltronics understand that, and that’s why we have over 150 highly trained, professional technicians to fix your problems quickly and accurately. Time is money. The slow copiers and printers of yesteryear have been replaced by high speed solutions. We offer the fastest color products on the market to keep you productive and your business moving. Caltronics Business Solutions provides production systems that are fast AND accurate. These products provide numerous document options, ultra high image quality, and large paper capacity. Scan Stations can handle high paper loads and offer quick, accurate scanning with dozens of options, providing an excellent solution for jobs large and small. Touch controls and network setup wizard capabilities make these powerful products user-friendly as well. Caltronics has the electronic document options that every business needs. We have products that allow our customers to scan and electronically file documents, which save space and waste. These documents can then be tracked, tagged, and managed without using a single piece of paper. We provide the hardware and software necessary for variable data printing. This allows you to set up a template for hundreds or thousands of documents and print everything from customer addresses to sales analyses. Variable data printing is THE way to save money on time and expenses when it comes to templated documents. There is a firm responsibility in being a holder of the Konica Minolta Pro-Tech Service Award. In earning this honor, Caltronics Business Systems can assure our customers that they will receive only the most reliable service and performance from us. This entry was posted in Uncategorized on April 12, 2016 by riehlt.